I’m not a big fan of white meat, but this chicken was so deliciously moist. I used organic chicken so I don’t know if that had anything to do with it or not or if it was just the marinade. But I must say, it was really good!! And it is only 216 calories per breast. Whisk buttermilk, mustard, 2 teaspoons salt, 1 teaspoon garlic powder, 1 teaspoon black pepper, and hot sauce together in large bowl. Add chicken, turn to coat well, cover, and refrigerate at least 1 hour or overnight. These are large chicken breasts so I made a half recipe for the two of us. You can put your chicken in a plastic bag with the marinade and is easier to turn over to marinade. Adjust oven rack to upper-middle position and heat oven to 400 degrees. Line rimmed baking sheet with foil, set wire rack on sheet (I didn’t do this), and coat with nonstick cooking spray. 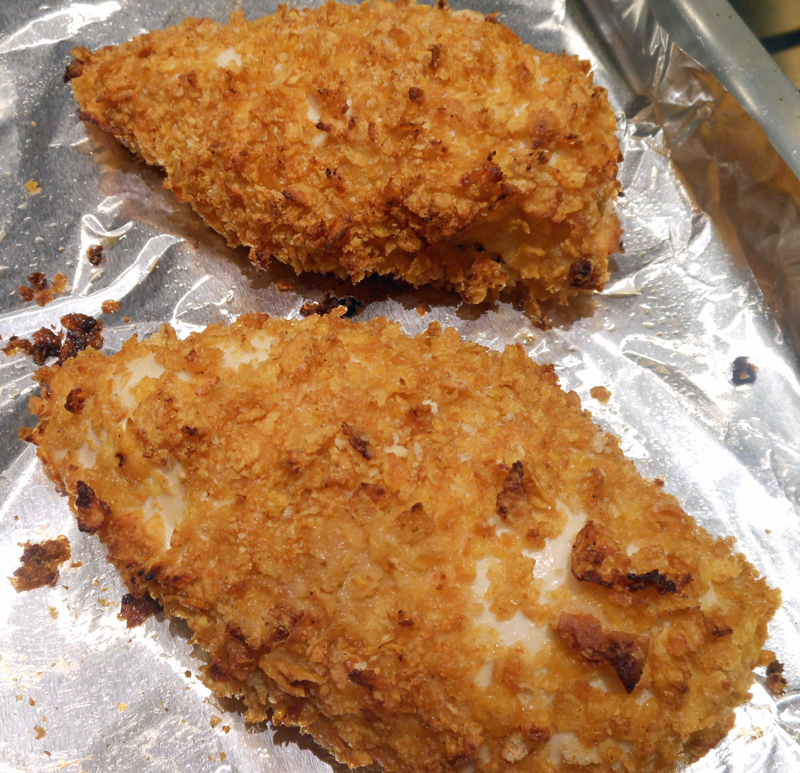 Gently toss corn flakes, bread crumbs, remaining 1/2 teaspoon garlic powder, remaining 1/2 teaspoon black pepper, remaining 1/4 teaspoon salt, poultry seasoning, paprika, and cayenne in shallow dish until combined. Drizzle oil over crumbs and toss until well coated. Working with one piece at a time, remove chicken from marinade and dredge in crumb mixture, firmly pressing crumbs onto all sides of chicken. Place chicken on prepared rack, leaving 1/2 inch of space between each piece. Bake until chicken is deep golden brown, juices run clear, and instant read thermometer inserted into breast reads 160 degrees, 35 to 45 minutes. * You may use bone-in chicken breast, if you like, it may take the full 45 minutes to bake. Check temperature deep into the breast. I baked my boneless breasts about 30 minutes.